Twproject’s installer will set some default configuration of the web server and database usage – which could need to be fine tuned for each particular environment. This section assumes some technical IT competence. Teamwork is a Java application, and it runs in Java web servers – by default Tomcat is hungry for memory; fortunately server memory is really cheap these days. The server where Twproject is running should have at least 2GB of memory, so that Teamwork can run in at least 1GB. If you want to go beyond the 1GB limitation, you should not use Windows servers, as these have notoriously contiguous memory limitations in running Java. Use a 64 bit Linux server and you will have no limitations about the amount of memory you can give to Java. It must be said that for most usage scenarios 1GB of memory for Twproject is more than sufficient. To do the changes: instructions for different OS follow. On OSX: if you are launching by script by hand, open the teamworkOsx.sh script, and change the -Xms64m -Xmx128m settings to a higher range. 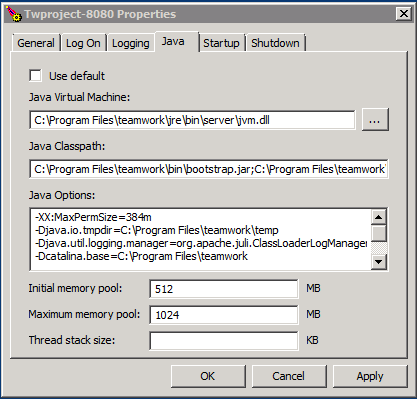 If you are launching Teamwork as service, change in [teamwork root folder]/launchdScript.sh the line “export JAVA_OPTS=-Xmx512M $JAVA_OPTS” (if it is #export JAVA_OPTS=-Xmx512M $JAVA_OPTS, remove the #). A way to reduce memory usage and speed up the interface is by disabling unused languages in your Twproject instance. If you log as administrator and go to the label management section, nel box “label rules” and say if you want to have only English as language, type EN in the enabled languages field and select SAVE. By default Twproject uses a database connection pool, called Proxool (http://proxool.sourceforge.net/). Twproject uses a very simple JDBC connection to “a database”. The entry point provided can of course be clustered: for this you must refer to your database specific documentation. Twproject can be clustered also as application: in case of load balance, so called “sticky sessions” must be enabled. The only conflict that could be raised in case of application clustering is in the scheduled jobs. Twproject has a built-in mechanisms that enabled only one node in the cluster for job scheduling. Of course we assume that all nodes in the application cluster will be pointing to the same database entry point instance (eventually clustered too).